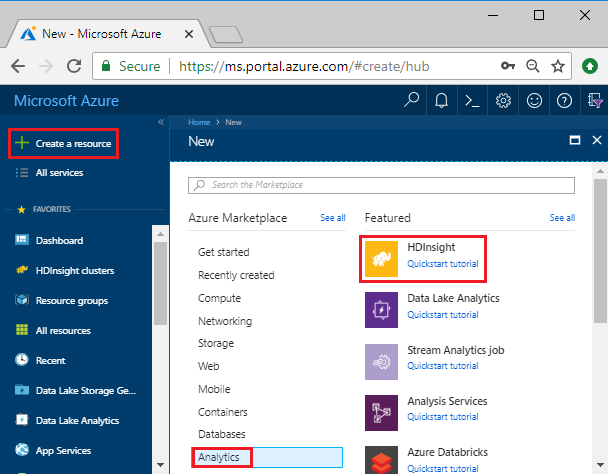 In this article, you learn how to create Apache Hadoop clusters in HDInsight using Azure portal, and then run Apache Hive jobs in HDInsight. Most of Hadoop jobs are batch jobs. You create a cluster, run some jobs, and then delete the cluster. In this article, you perform all the three tasks. 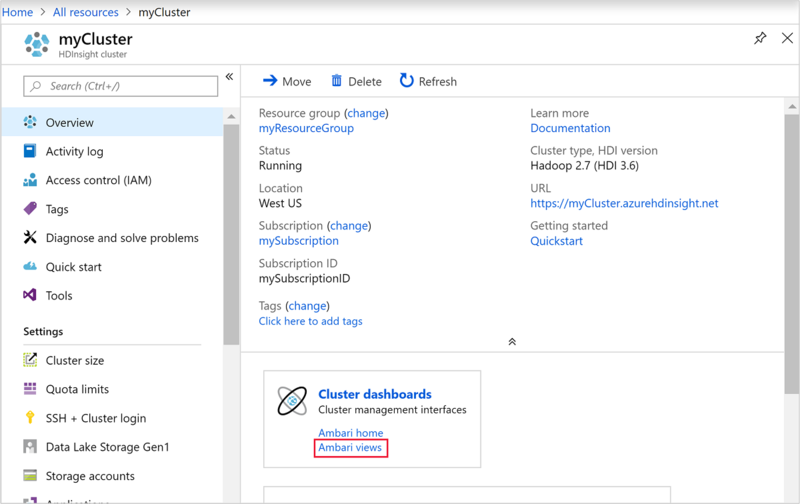 In this quickstart, you use the Azure portal to create an HDInsight Hadoop cluster. You can also create a cluster using the Azure Resource Manager template. Currently HDInsight comes with seven different cluster types. Each cluster type supports a different set of components. All cluster types support Hive. For a list of supported components in HDInsight, see What's new in the Apache Hadoop cluster versions provided by HDInsight? 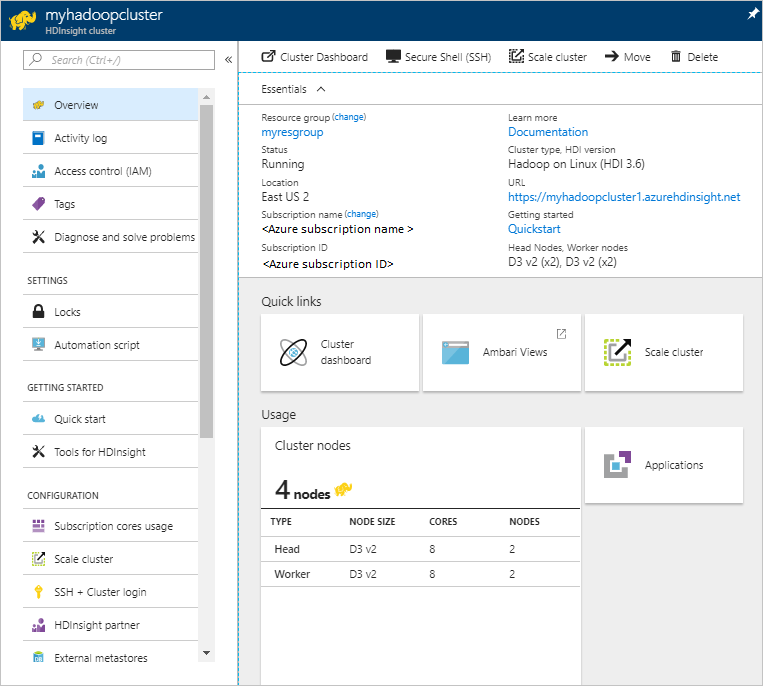 In this section, you create a Hadoop cluster in HDInsight using the Azure portal. In the Azure portal, select Create a resource > Data + Analytics > HDInsight. Cluster name Enter a name for the Hadoop cluster. Because all clusters in HDInsight share the same DNS namespace this name needs to be unique. The name can consist of up to 59 characters includings letters, numbers, and hyphens. The first and last characters of the name cannot be hyphens. Subscription Select your Azure subscription. Cluster Type Skip this for now. You provide this input in the next step of this procedure. Cluster login username and password The default login name is admin. The password must be at least 10 characters in length and must contain at least one digit, one uppercase, and one lower case letter, one non-alphanumeric character (except characters ' " ` ). Make sure you do not provide common passwords such as "Pass@word1". SSH username The default username is sshuser. You can provide another name for the SSH username. Use same password as cluster login Select this checkbox to use the same password for SSH user as the one you provided for the cluster login user. Resource group Create a resource group or select an existing resource group. A resource group is a container of Azure components. In this case, the resource group contains the HDInsight cluster and the dependent Azure Storage account. Location Select an Azure location where you want to create your cluster. Choose a location closer to you for better performance. Click Select and then click Next. Primary storage type For this article, select Azure storage to use Azure Storage Blob as the default storage account. You can also use Azure Data Lake Storage as the default storage. 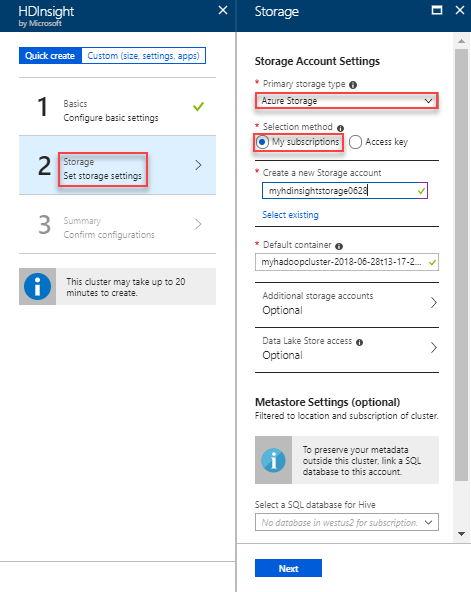 Selection method For this article, select My subscriptions to use a storage account from your Azure subscription. To use storage account from other subscriptions, select Access key and then provide the access key for that account. Create a new storage account Provide a name for the storage account. Accept all other default values and then select Next. In the Summary tab, verify the values you selected in the earlier steps. Select Create. 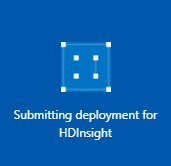 You shall see a new tile titled Submitting deployment for HDInsight on the portal dashboard. It takes about 20 minutes to create a cluster. Once the cluster is created, you see the cluster overview page in the Azure portal. 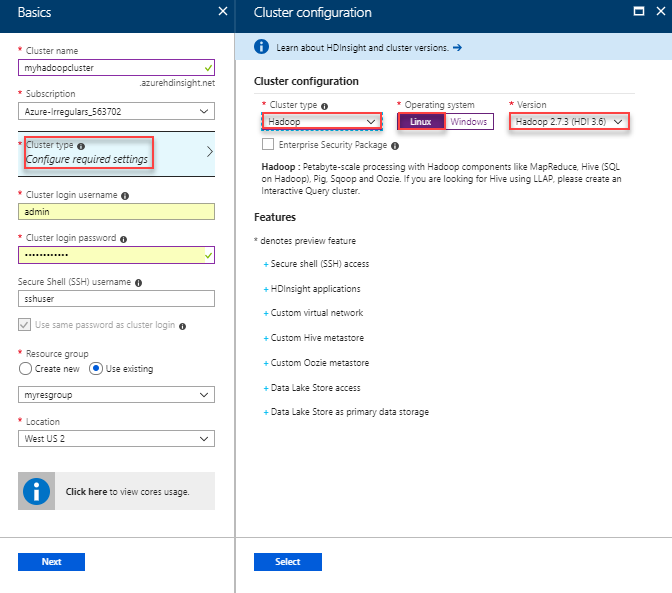 Each cluster has an Azure Storage account or an Azure Data Lake account dependency. It is referred as the default storage account. 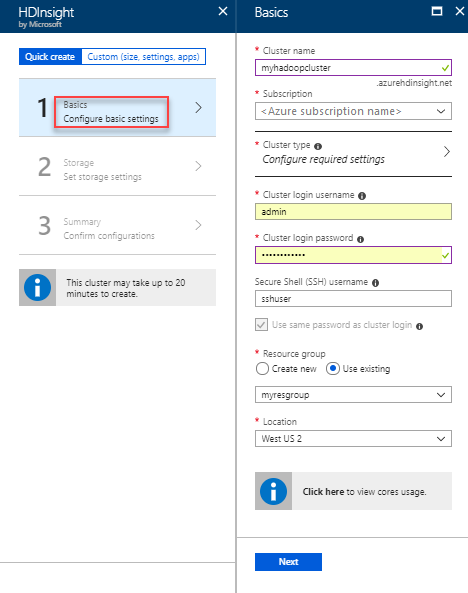 HDInsight cluster and its default storage account must be co-located in the same Azure region. Deleting clusters does not delete the storage account. 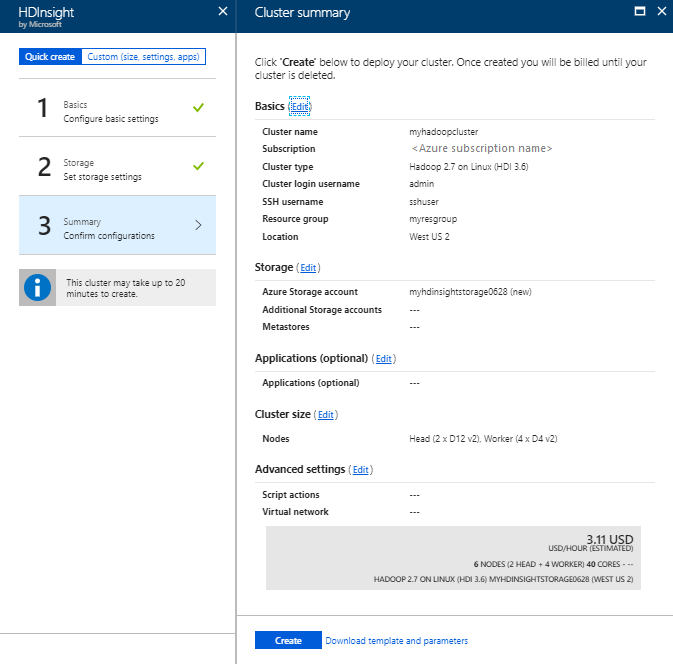 For other cluster creation methods and understanding the properties used in this tutorial, see Create HDInsight clusters. Apache Hive is the most popular component used in HDInsight. There are many ways to run Hive jobs in HDInsight. In this tutorial, you use the Ambari Hive view from the portal. For other methods for submitting Hive jobs, see Use Hive in HDInsight. To open Ambari, from the previous screenshot, select Cluster Dashboard. You can also browse to https://<ClusterName>.azurehdinsight.net, where <ClusterName> is the cluster you created in the previous section. Enter the Hadoop username and password that you specified while creating the cluster. The default username is admin. Select Execute. A RESULTS tab appears beneath the QUERY tab and displays information about the job. Once the query has finished, The QUERY tab displays the results of the operation. You shall see one table called hivesampletable. This sample Hive table comes with all the HDInsight clusters. You can also save the results of the query. Select the menu button on the right, and specify whether you want to download the results as a CSV file or store it to the storage account associated with the cluster. After you have completed a Hive job, you can export the results to Azure SQL database or SQL Server database, you can also visualize the results using Excel. 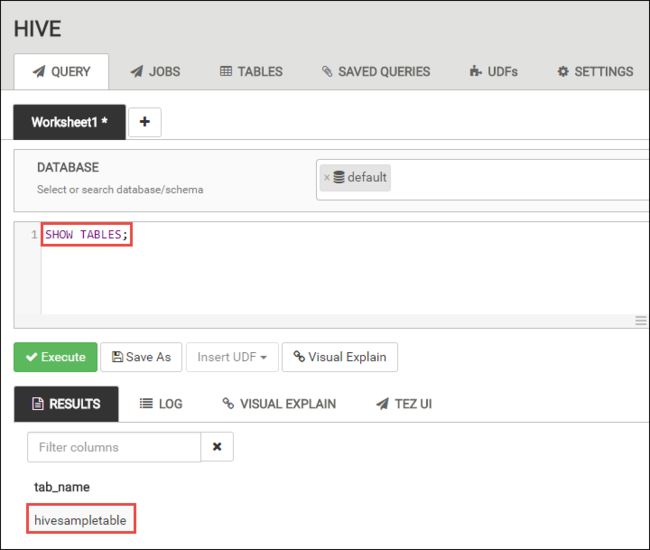 For more information about using Hive in HDInsight, see Use Apache Hive and HiveQL with Apache Hadoop in HDInsight to analyze a sample Apache log4j file. After you complete the tutorial, you may want to delete the cluster. With HDInsight, your data is stored in Azure Storage, so you can safely delete a cluster when it is not in use. You are also charged for an HDInsight cluster, even when it is not in use. Since the charges for the cluster are many times more than the charges for storage, it makes economic sense to delete clusters when they are not in use. If you are immediately proceeding to the next tutorial to learn how to run ETL operations using Hadoop on HDInsight, you may want to keep the cluster running. This is because in the tutorial you have to create a Hadoop cluster again. However, if you are not going through the next tutorial right away, you must delete the cluster now. Go back to the browser tab where you have the Azure portal. You shall be on the cluster overview page. If you only want to delete the cluster but retain the default storage account, select Delete. If you want to delete the cluster as well as the default storage account, select the resource group name (highlighted in the previous screenshot) to open the resource group page. Select Delete resource group to delete the resource group, which contains the cluster and the default storage account. Note deleting the resource group deletes the storage account. If you want to keep the storage account, choose to delete the cluster only. In this tutorial, you learned how to create a Linux-based HDInsight cluster using a Resource Manager template, and how to perform basic Hive queries. In the next article, you learn how to perform an extract, transform, and load (ETL) operation using Hadoop on HDInsight. For information on how HDInsight uses Azure Storage, see Use Azure Storage with HDInsight. 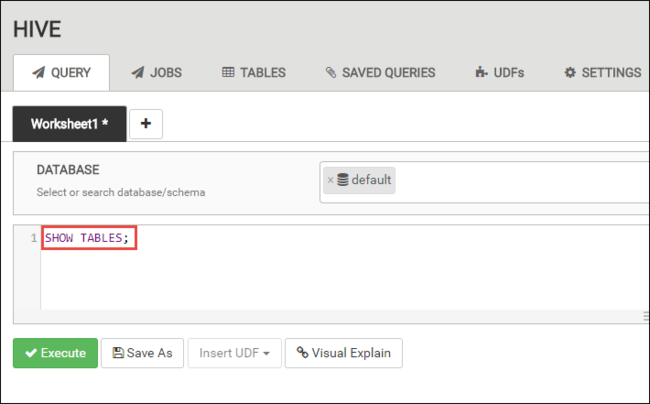 For information on how to upload data to HDInsight, see Upload data to HDInsight. To learn more about using Hive with HDInsight, including how to perform Hive queries from Visual Studio, see Use Apache Hive with HDInsight. To learn about Pig, a language used to transform data, see Use Apache Pig with HDInsight. To learn about MapReduce, a way to write programs that process data on Hadoop, see Use MapReduce with HDInsight. To learn about using the HDInsight Tools for Visual Studio to analyze data on HDInsight, see Get started using Visual Studio Hadoop tools for HDInsight. To learn about managing your Linux-based HDInsight cluster, see Manage HDInsight clusters using Apache Ambari. To learn more about the options you can select when creating an HDInsight cluster, see Creating HDInsight on Linux using custom options.